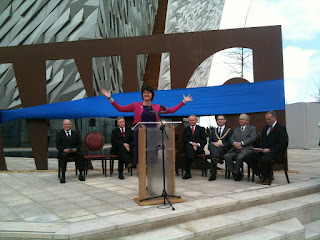 Arlene Foster opens the Titanic Belfast, saying "we did it"
Who would be a local councillor? It's a serious question. I've mulled over the central matter in hand on many occasions. I was talking it over with two good friends recently, one is a Labour councillor who has come to it in her forties and is doing very well - partly because she has been experienced in education and local issues in Manchester. The other is a former councillor who doesn't see the point these days and has access to power through a very successful lobbying organisation he leads. We have a situation in Marple South where a dismal councillor of retirement age is seeking re-election, candidates are here. For many reasons she should call it a day - but she's hanging on. Maybe it's because she's retired that she can supplement her other income with the £25,000 or so she picks up in expenses and allowances. Her opponents include a young man from the Conservative Party- who is at the start of a journey where he hopes to make a difference and represent the people through public service. The incumbent has already dismissed him as "faceless" which is a disgraceful piece of dog dirt Lib Dem politics. Personally, I hope he does well, and uses the energy of his youth and his freedom from wider family responsibilities to get stuck in. Who else would have a go? Professionals in their 30s and 40s with families can't afford to - I'm sure many who have genuinely weighed it up and just don't see elected public service as an option. This isn't to argue for larger salaries - but it does pose a problem. Maybe there are too many councillors? Maybe there is too much local government? And what structure would work that would aid the one cause I have consistently banged on about all my life - devolution, power and autonomy for the North. Taking this a step further, I was considering this as I watched the minister for enterprise and tourism in Northern Ireland, Arlene Foster, speaking at a conference I ran recently. She presides over her portfolios with great skill and I was impressed that she is a politician of some stature. Without even getting into the traditions and wings of Ulster Unionism that she comes from, you have to bear in mind that as a qualified lawyer she has other opportunities in her life. I'd estimate that if she were to have moved to England, could well be a Cameroonian Conservative and would easily be ministerial material. Now, her electorate is only 1.5 million, yet her impact and capacity to improve and enhance the lives of people in Northern Ireland is immense, she makes that point here. Contrast that with the most powerful political jobs in the North of England. Liverpool city council were blessed to have Mike Storey as a capable leader. Beyond that? History suggests it was thin fare. Beyond Sir Richard Leese in Manchester? There is a massive quality gap. There are, I am led to believe, a number of emerging councillors, of which my friend is one, but it all requires a disproportionate investment of time and brainpower to make sure the bins are collected and the schools don't employ psychopaths. I kind of sympathise with the Nicholas Ridley view of local government, to be honest. If you know what it is, fine, if you don't, that's fine too, but you should read your political history more. Which brings me to the issue of city and borough Mayors. Who would get the job if Manchester has an elected mayor? Probably someone from the local Labour machine, like current leader Sir Richard Leese, just as Joe Anderson is a shoe in for Liverpool mayor. It's a joke and a waste of time. But a city region Mayor, covering the 10 boroughs, with accounatbility to the people, power over the executive that is running skills, education, inward investment, health policy, transport and an airport - that's a job worth having. Just as London's Mayoral contest has attracted two heavyweights like Boris Johnson and Ken Livingstone, so too could a city region with a large budget, genuine autonomy over key issues and, nakedly, proper influence. There might be a Mancunian Arlene Foster out there, we can but hope - but we can also create the structures to attract such talent to public life. Otherwise we just get lumbered with yet more like Shan Alexander.